Frito-Lay may have discontinued its 100% compostable packaging for most of the SunChips line in the U.S. (it was deemed too noisy by consumers, and sales plummeted). But the drama continues in Canada, where Frito-Lay has decided to keep the ultra-loud packaging–and to offer customers free earplugs to drown it out. 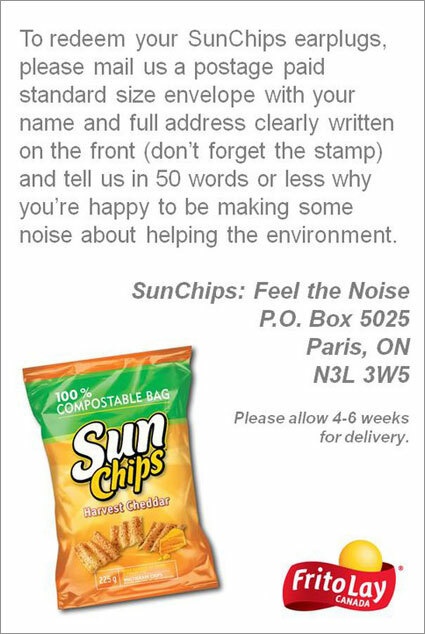 The offer, which can be found on the SunChips Canada Facebook page, implores customers to check out the noisy bags. If they deem it too loud for comfort, Frito-Lay asks them to send a letter explaining why they’re “happy to be making some noise about helping the environment”. It’s a neat bit of marketing judo to address SunChips’s image problem — take the problem and turn it into an amusing headline. (The company may hae been inspired by a Facebook group called “Sorry But I Can’t Hear You Over This SunChips Bag,” which now has more than 52,000 friends). So did Frito-Lay give up on its product too soon south of the Canadian border? Americans may well have appreciated the cheeky earplug offer–and the company’s willingness to stand by an admirable product.